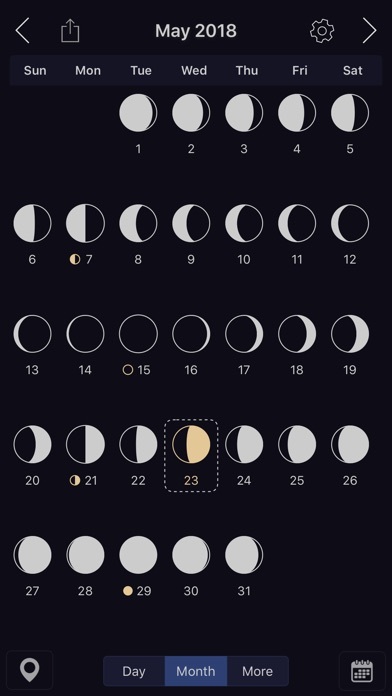 Moon Calendar Pro brings you a delightful user-interface and thoughtfully crafted visual charts with all the critical info you seek about our Moon without any of the complexities of most other apps in its class. View Moon Calendar customized for your selected location. Easily add and switch between locations. 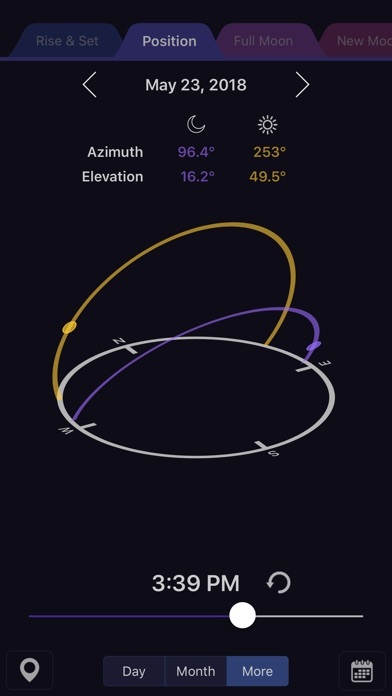 Visualize the actual positions (azimuth/elevation) of the Moon and the Sun in the sky at any given time. Great for photography enthusiasts and eclipse observers. Look at the Full moon chart to quickly find out which date the Full Moon will occur in an entire year to plan your next beach party on the weekend. Or if you prefer lookup the New Moon similarly. A visual timeline chart plotting Sun & Moon rise and set times to help you find the best times to photograph the rising Moon just a few minutes after the sunset (or before a sunrise). View exact time of the Full Moon and New Moon (from the full moon and new moon chart views). View exact times of Sunrise, Sunset, Moonrise and Moonset. A Today widget that shows the current Moon phase and time to next Full moon or New moon. Smooth interface, very interactive, beautifully detailed, crisp! Easy to use to get the information quick. I never write reviews but this app called for it. 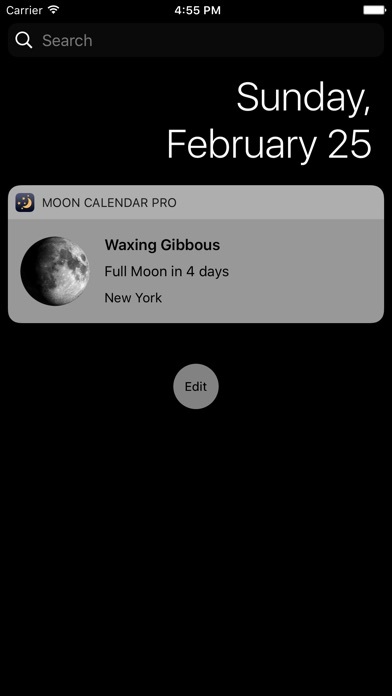 Just wanted a simple moon app with moonrise/set times, calendar, percentage illumination, and position in the sky; without intrusive adds. None or the other apps have this combination. I highly recommend it. It’s fun to check out the status of the moon and learn about its stages and position in the sky. For me , it’s complicated but I am learning. Moon Pro is a great product. I use it every week. I really like the user interface. 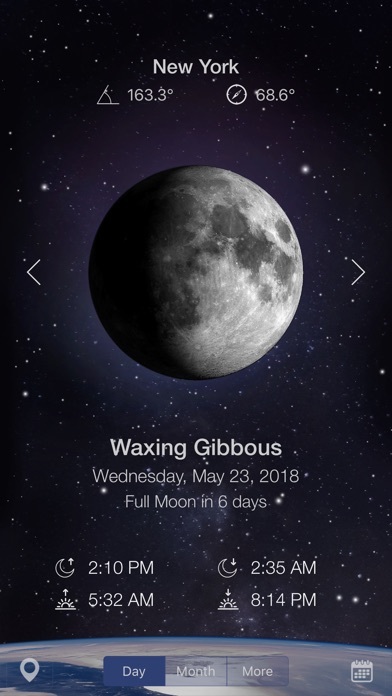 I like this app, and use it with my fourth graders for moon cycles. I enjoyed this app since day 1! I travel a lot mostly on the east-cost & I know how our moon can change things so for me it's a definitely an A+ app & I can't wait to see what comes next! Thank you! P.A.L.